Citizens of most nationalities will need a visa to visit China including American crew members. The number of entries depends on how many times your ship leaves China and enters a non-Chinese port. The Chinese consulate does not like to issue multi-entry visas so provide them with your itinerary when applying for the visa. In 2015, new 10 year visas were introduced at the same cost of short term visas. Embarking and disembarking cruise passengers transiting through the airport with a stay of less than 24 hours may be exempt from visa requirements. Please check with your consulate or embassy since this maybe a new change. Cruises that turnaround in Beijing actually use the port in the Tianjin region near the town of Tanggu. See the Tianjin page for details. Beijing's Capital Airport (PEK) has the world's second largest terminal at T3. You can ride the Airport Express to downtown in 30 minutes for 25 RMB and connect with other subways lines. PEK airport is running at capacity so a new airport is being built south of the city with a scheduled completion date in 2019. Taxis are inexpensive in Beijing. Daytime rate is Y10 for the first three kilometers, Y2 each additional kilometer. Rates increase slightly in the evening and for longer trips. Most taxi drivers do not speak English so make sure you have your destination written out in Chinese. Also make sure your driver uses the meter. The metro is a fast and cheap way to get around though stations tend to be fairly spread out. Fares depend on distance traveled and start at Y3. Ticket machines have English menus. All take coins and but some will only take 5 or 10 Yuan bills only so check on the machine. Change can be obtained from staffed counters if the machine will not take your larger bills. Tap the card to enter a station and insert it into the gate to exit where it gets returned. Tiannamen Square - free to enter though you need to pass security. You can visit Mao's tomb but bags and photos are not allowed inside (bag check across the street). Forbidden City- You can go through several courtyards before you will need a ticket to continue. Different buildings on the site also have separate entry fees. Temple of Heaven - ticket is required for either the grounds only or to walk through the temples. 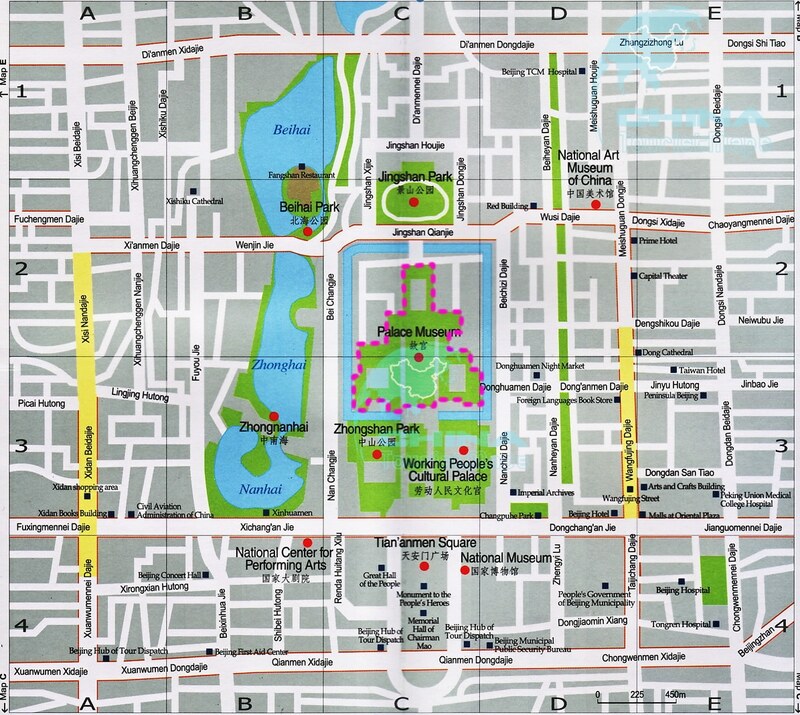 Located south of Tiannamen Square. The three other temple complexes (Temple of Sun, Earth and Moon) are further from the city and less popular. Wangfujing - a pedestrian shopping street east of the Forbidden City. The Wangfujing Snack Street, located in hutongs just west of the main street is densely packed with restaurants and street food stalls. Opens at 11am. APM is a large modern mall in the area with a equally large food court. Oriental Plaza Mall as at the south end with a Food Repulic food court. New Silk Market/Xiu Shui - Shanghai's fake market with indoor shopping mall. Approx two miles east of the Forbidden City. Metro Yonganli. Xidan Beidajie - Another shopping street one mile west of Tiannamen. This street has both markets and malls. Hong Qiao Pearl Market - Famous for pearls but has souvenirs and a large toy market. Northeast corner of Temple of Heaven. Metro Ciqikou. Bianyifang - Chain with multiple locations. Dadong Roast Duck - Chain with a fast food outlet serving duck burgers at China Central Place. Quanjude - Famous chain with 150 year history. Locations include a large 600 seat restaurant near Hepingmen Gate (Peace Gate), Wangfujing Pedestrian street, and original restaurant on Qianmen Street. Cafes and restaurants may provide free wifi for customers. Google, gmail and facebook are all blocked in China. It is recommended to use a VPN to get around it.